On the evening of Thursday 11 May, I stood in my kitchen with the lights out. I sipped a cold beer and watched the rain pour down onto the garden. It was beautiful. So beautiful in fact, I wanted more of the experience and so opened the window to let my ears soak up the sound of the heavy drops as they splattered over the patio and drummed on the plastic recycling bin. Just when I thought the event couldn’t get any better, thunder grumbled out of the clouds above. Bliss. I doubt I’m the only one who enjoyed this luxury. It’s been a dry spring and in Wales, we are used to the rain wetting our world for much of the time. As a result, I rarely water the allotment and so weeks without rain is like stepping into the twilight zone. It’s been a while since I published a diary update. 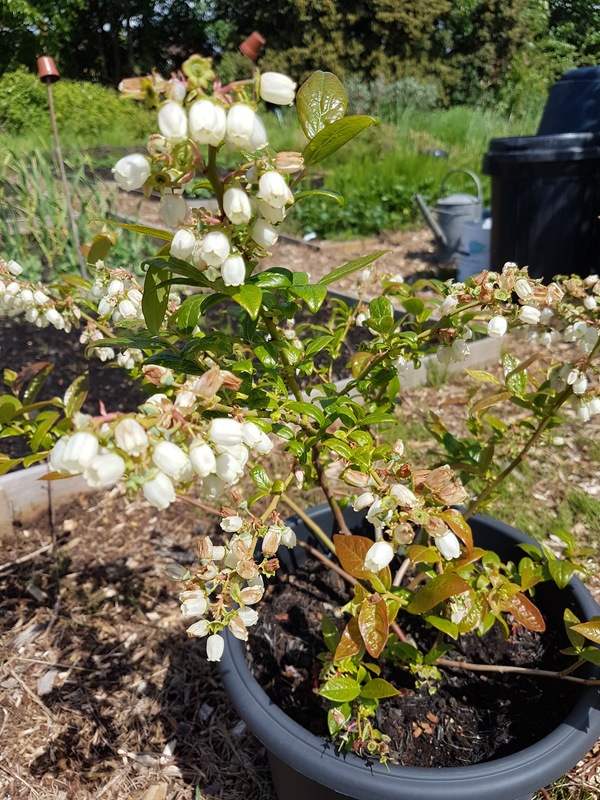 This isn’t because I’ve not been doing anything with the allotment garden – spring, after all, is a busy time in the gardening world, but I’ve not really been doing anything worthy of a full diary blog. I have been updating Twitter and Instagram with our sowing and growing, however. When spring arrived, the uncultivated areas on the plot burst into life. Weed life. One thing I’ve learned is that the areas of undeveloped plot, unloved and uncared for (in a time before me) become hard work. It’s not that I’m shy about pulling the shirt sleeves up and breaking a sweat, it’s simply because I don’t need to break my back over that ground at the moment and by waiting for autumn when the couch grass and brambles have died back, the job becomes much easier. It’s given me a time to reflect on the area I have worked and brought back into production. In comparison to what it looked like when I signed on the dotted line, it’s something I’m very proud of and I’m enjoying the rewards. However, I did get rather carried away with moving forwards and as I don’t want to spend another summer carrying out more hard graft, I have the opportunity to fine tune and improve the existing section of the allotment. 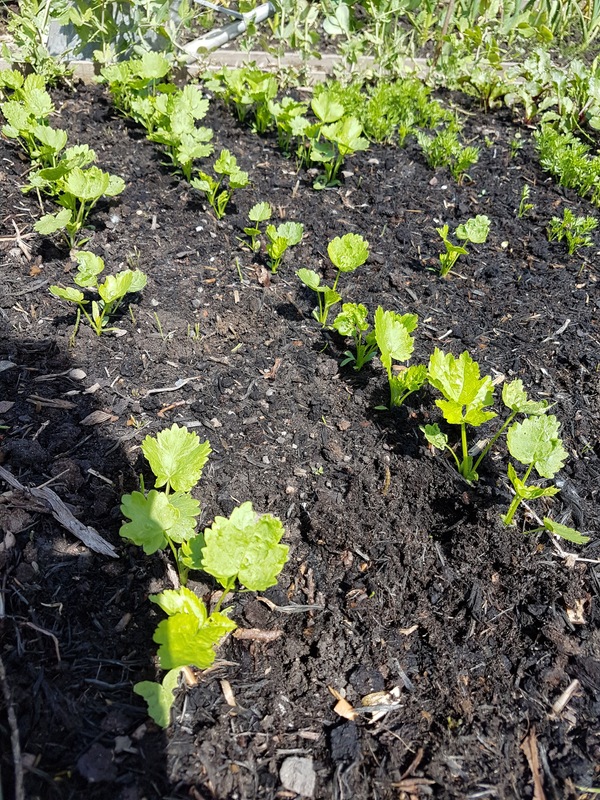 There are sections of the raised beds that need to be finished off and I still have areas of the cultivated section to clear and build more growing space. In fact, I’ve calculated I can increase the number of beds near the front of the allotment by at least six. That doubles the beds I have already and I still have at least 30 feet of the allotment to cultivate (the autumn work). There’s also a long strip running down the east side of the allotment that I’ve ignored. It’s a narrow mound of grass and weeds. This banking was created by the previous tenants after digging a ditch the length of the plot. Since digging out all the paths and building raised beds on the plot, the ditch, a solution for combating the high levels of water this area suffers, is pretty redundant and the bank is just a waste of space. If I remove the banking, I’ve worked out I can create even more raised beds running the length of the allotment. These beds will run perpendicular to the existing arrangement of beds on the plot and be of at least the same size. Brilliant! When the allotment is fully developed, the amount of growing space that will be available really amazes me. I will update the diary as this work progresses. In the meantime, it’s tremendously exciting to see so many crops bursting into life. Blueberry flowers are covering the three bushes we have. I’m hoping this will mean a bumper crop this year. 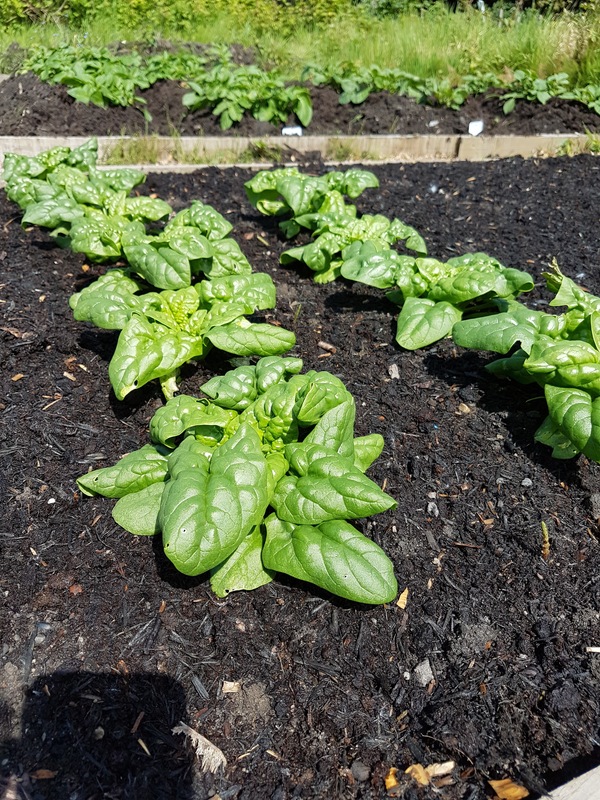 The spinach looks fantastic and it’s been such an easy crop to grow. This is the first time I’ve managed a successful germination of carrots and I’m excited with their progress. 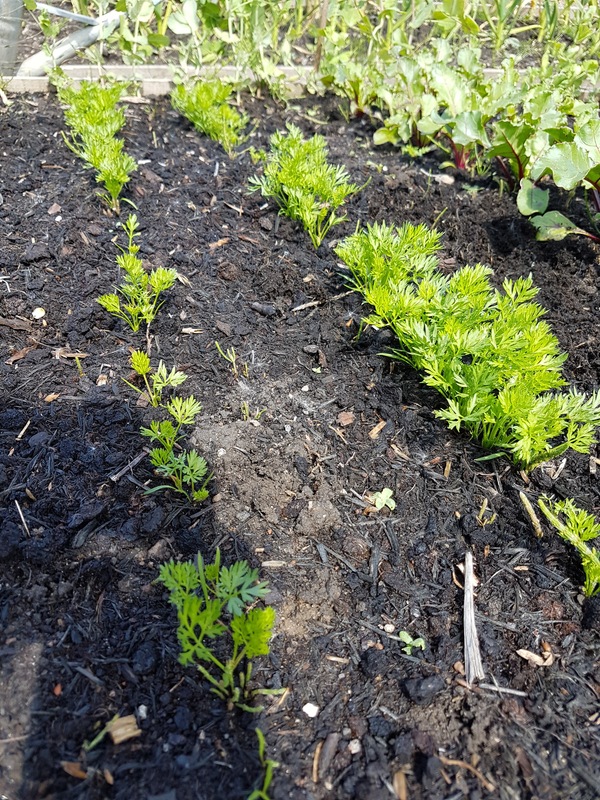 Finally, the parsnips – I really wanted to have a crop of parsnips this year and I hope it will mean home grown parsnips for Christmas dinner. We’ve had our first taste of the allotment produce. Last week I harvested some rhubarb for the first time. I’ve needed patience as the two crowns were planted last year and were left to establish. The wait was worth it. A few stems stewed and served warm with ice cream. Simple and truly delicious. This weekend I’m planting out the squash and pumpkins. I have a wonderful selection including, Turks Turban, Honey Bear and Old Boar white. If you read my article earlier this month on pumpkins and the disgraceful waste every year as a result of Halloween, you will know I’m very keen to encourage others to grow their own. As a result of that article, the nice people at Marshalls got in touch. I’m trialling some mini pumpkin and squash as I want those without an allotment or large garden to grow their own too. I’m asking a few friends of mine to grow these varieties in their own gardens to find out how they get on. The two varieties are Festival and Wee b little. The squash can be grown vertically which means it takes less space to accommodate. I’m going to follow along with their progress right up to tasting – my hope is it will inspire those with a small space to grow their own pumpkins and squash in the future. It’s such an exciting time of the year when you’re growing your own fruit and veg. After the dark and cold days of winter and the careful nurturing of seeds and seedlings in early spring, now the promise of what we have to come is a beautiful sight. I hope you all are enjoying the spring and your own crops are giving you the same amount of pleasure. I’d love to hear how your own allotments and kitchen gardens are progressing. Drop me a comment below or join me on Twitter and Facebook. You are not the only one who was rubbing their hands with glee at the rain. It’s amazing how much the plants respond with each shower! I think you truly know you are a gardener when you look at persistent rain and think “fantastic!”. I am waiting for a lottie plot to become available, 8yr waiting list locally. I am making do with 3 raised beds in garden veg plot. Looking forward to a half decent crop this summer. We had such a dry early Spring in Wiltshire too so I was with you “toasting” the rain! Now, it hasn’t really stopped but I’m still happy! Funny how the weather can dictate feelings. I have a new garden Linky party going on over at the old house if you are interested….